The HCS300 is a code hopping encoder designed for secure Remote Keyless Entry (RKE) systems. The HCS300 utilizes Microchip’s patented KEELOQ® hopping technology, which incorporates high security, a small package outline and low cost to make this device a perfect solution for unidirectional remote keyless entry systems and access control systems. The HCS300 combines a 32-bit hopping code generated by a non-linear encryption algorithm, with a 28-bit serial number and 6 status bits to create a 66-bit transmission stream. The length of the transmission eliminates the threat of code scanning and the code hopping mechanism makes each transmission unique, thus rendering code capture and re-send (code grabbing) schemes useless. The encryption key, serial number, and configuration data are stored in EEPROM, which is not accessible via any external connection. This makes the HCS300 a very secure unit. The HCS300 provides an easy-to-use serial interface for programming the necessary security keys, system parameters, and configuration data. The encryption keys and code combinations are programmable but read-protected. The HCS300 operates over a wide voltage range of 2.0V to 6.3V and has four button inputs in an 8-pin configuration. This allows the system designer the freedom to utilize up to 15 functions. Additional features include an LED Drive, Overflow bits, Time-out, and Battery low indicator. 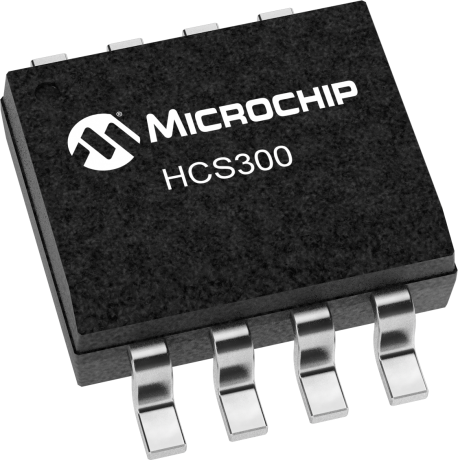 The HCS301 operates in a voltage range of 2.0V to 6.3V.